You may have already heard that the Friends of Ashburton Station (FoAS) and South Devon Railway Trust (SDRT) sought legal advice over Dartmoor National Park Authority’s (DNPA)handling of the Chuley Road Masterplan. The outcome was that DNPA planners had not followed the process set out in the Planning and Compulsory Purchase Act 2004 (‘PCPA 2004’) and the Town & Country Planning (Local Planning) (England) Regulations 2012 (‘the Regulations’) correctly. A letter submitted to DNPA by the SDRT solicitors brought DNPA’s attention to this fact and offered them the opportunity to correct this. As a result the masterplan has been rescinded and its’ status returned to ‘Draft’. In basic terms the part of the process in question is the consultation and the way it was, or was not, undertaken. Legal advice was sought on the grounds that we felt the consultation process was flawed, which has been proven to be correct. The rescinding of the masterplan is unlikely to change the end result but it does however give the residents of Ashburton one final chance to make their voices heard and speak up for what they want to see. Ultimately, it will be down to the local community, rather than the enthusiasts, whether the reinstatement of a railway connection with the SDR and Network Rail is ever to be possible. We have heard mixed opinions regarding the railway being returned to Ashburton but it is very difficult to gauge to overall feelings of the town. It is because of this we are asking the residents of to fill in this questionnaire, our aim is to try and gauge the honest opinion of Ashburton, its’ residents and businesses. We will pass on all submissions to Dartmoor National Park Authority and hope that it gives an honest and genuine view from the town. The details of how Chuley Road could be developed around a returning railway are still very much open to further discussion with all interested parties. All we are trying to gauge at this point is whether Ashburton supports the concept of the railway returning and would like to see their station restored to its original purpose and see steam trains return or not. Please fill in the form below and let us know your views. We would be grateful if you would fill in your town and Postcode, this is so we can confirm which answers are from the residents of Ashburton, although we are of course happy to hear from anyone. How satisfied are you with the adopted Chuley Road Masterplan? How satisfied are you with the Chuley Road Masterplan consultation process? Which would you rather see happen in Chuley Road? A planning application has been submitted to Dartmoor National Park Authority that will affect the old route of the railway through to Ashburton Station, effectively it will prevent any future potential to re-connect Ashburton Station to the South Devon Railway. Please submit your comments to DNPA, we suggest your comment is based around the fact that part of the application compromises the footprint of the former railway line and that you object to any housing being built on land that will preclude any future possibility for re-instating Ashburton’s Railway Station and to link it back with the South Devon Railway at Buckfastleigh. For further information and to see the detailed application please follow this link. If you know anyone who lives in or around Ashburton please get them to submit their comments – they are likely to be better considered than hundreds of comments from ‘ousiders’. As a result of legal investigations commissioned by the South Devon Railway Trust (SDRT) with the generous support of many in this group, Dartmoor National Park Authority (DNPA) has acknowledged some fundamental flaws in the Chuley Road Masterplan. These relate to the type of planning document adopted by the planners, and consequently the inadequacy of consultation processes pursued by them in constructing the Masterplan. As a result, DNPA planners have been forced to recommend the withdrawal of the final document approved by its Members, and return the Masterplan to consultation. Consequently, the Masterplan will be downgraded to a draft once again, and those with views will be able to have them heard in due course. We await news of how DNPA will be consulting with interested parties and ensuring their views are heard more appropriately than before. But this should at least be an opportunity for those who feel passionately about the safeguarding of railway land and heritage assets on this site to have their views considered properly and under the spotlight. This will be our last chance, your last chance, to make a difference. David, myself and others have worked tirelessly to make a united case for safeguarding the heritage of this site. We feel we have contributed everything we can to establishing this group with a presence and a voice, and to make a difference to a planning process that has been unwilling to give us a fair hearing. We recognise this is now a fight to be taken on by the many passionate voices we’ve been hearing among the town’s people and beyond, who see the need for a longer term vision for this site. FoAS has been working with the South Devon Railway Trust (SDRT) and others to investigate the potential merits and risks involved in challenging the Masterplan further. We’ve taken professional legal advice and have consulted many who have experience in the field. Following these discussions, some legal work is currently in progress. We can’t comment further at this stage, and would ask that you respect the sensitivity of the topic in your discussions online. The SDRT has funded this initial work, and would welcome donations towards the cost. For more information on how you can make a donation please click here. It’s very important to stress that this is preliminary work, with no obligation or commitment to launching a judicial review at this stage. The next point is also very important. Further legal action, or other actions to further the project, would not only require significant funding, but a major commitment of time and energy on the part of those who wished to take it forward. Having worked tirelessly to take the campaign to its current point, the present FoAS committee does not feel able to resource such a project in its current form, and we are now calling for those who feel passionately that this fight should continue to take more of a leading role. If you feel you can offer the necessary commitment, time and skills to play an active and immediate role in continuing the campaign, please contact info@friendsofashburtonstation.co.uk. From all our discussions it’s clear there remains great passion, both inside the town and out, for a continued campaign to protect and fully exploit Ashburton’s railway heritage. The challenge now for those who wish to continue the campaign is to convert their passion into the practical effort and, ultimately, funding required to move this on to the next stage. A brief note on behalf of the FoAS Committee to let you all know where we are. Having taken some time to reflect on the DNPA decision to accept the Masterplan, our group has several potential courses of action. We’re currently taking advice from a number of bodies, and talking to organisations and individuals whose support has been instrumental so far, about how they see the next stage. We’re also listening to new ideas and offers of help. We feel sure you’ll appreciate these discussions are live and sensitive, and it wouldn’t be right to elaborate in this public forum. For similar reasons, it isn’t appropriate for us to enter into some of the discussions on social media right now. But rest assured, we all do monitor the threads very closely, and we also read and consider every comment. We will be privately following up on your many welcome ideas and offers of help. It’s been really heartening to see that, far from dampening spirits, the DNPA decision has actually redoubled our group’s passion for the fight for Ashburton Station. Whatever the next steps, we feel sure this will serve the group well. The Committee is mindful that time is pressing on, but because our next move will be an important one, we know it must be made with careful consideration and planning. Friends of Ashburton Station are, of course, extremely disappointed with DNPA’s decision to accept the Chuley Road Masterplan, thereby denying Ashburton the opportunity of the benefits of a heritage railway connection in the future. We are exasperated by the determination of planners to dismiss our calls for changes to the Masterplan. Our group of volunteers have worked tirelessly to demonstrate to DNPA the potential social and economic benefits a railway could bring to the town. Despite a wealth of support from the local community, businesses and national bodies, they have chosen not to listen. Instead, DNPA has accepted a report from its planners in which no railway bodies have been consulted, a report which consequently contains several major inaccuracies. In doing so, Members have endorsed the short-sighted predisposition towards other uses for the site, and have not given a fair hearing to the railway proposition. 1420’s Last Trip to Ashburton? This Saturday (4 July 2015) is likely to be the very last time that a former Great Western Railway steam engine will ever visit the sleepy Dartmoor town of Ashburton when diminutive old GWR 0-4-2 Tank No. 1420 is hauled dead — out of steam and without a fire in its belly — through the narrow streets on the back of a low loader for the local Carnival in order to say a final goodbye to the town it once served so well. The former station — with it’s wonderful, almost unique Brunel-designed overall timber roof and once the terminus of a 10-mile branch line from Totnes in South Devon — will probably never again hear the whistle of a steam train. This is despite the efforts of our group of local people and railway enthusiasts who wish to see the town’s historic station and route protected so that it might one day re-join the nearby South Devon Railway which has run its steam trains down the scenic valley of the River Dart for the last 46 years since 1969 and that now carries 100,000 passengers a year. The reason for the ‘fond farewell’ by the steam engine, owned by the South Devon Railway, is because Ashburton station and part of the track bed is set to be swept away under a new so-called ‘Masterplan’ for the Chuley Road area of the town which will be discussed by the Dartmoor National Park Authority this coming Friday (3 July), and whose members are expected to simply ‘rubber-stamp’ the recommendation of their own planners. Under the plans, Ashburton station and the area around Chuley Road will see a convenience store and houses built over it despite howls of protest from many quarters about a lack of vision and ambition for the site; a failure to acknowledge the railway’s strong history in the town, and the enormous potential for the future which bringing steam trains back would provide as has been seen already in many other parts of the country. National railway magazines and several web forum groups have flocked to support our campaign, we have been supported too by many local people and businesses who do not wish to see the town’s nature changed for the worse by such a development and also lose a potentially, lucrative life-line that would bring visitors right into the town centre with its vibrant local shops, but without their cars which could be left at the South Devon Railway’s nearby large station car park at Buckfastleigh. We are urging local people to lobby members of the Dartmoor National Park Authority this week in the hope that they will kick out the Chuley Road Masterplan and safeguard the station site and track bed for the future and the time when trains might be able to return again to Ashburton. Our group Chairman Alasdair Page said: “The visit by steam loco No. 1420 to Ashburton this coming Saturday will be a poignant one if the National Park Authority members vote to endorse the seriously flawed Masterplan the day before as recommended by their planners. Assuming the Masterplan is adopted, the former Ashburton branch steam loco No. 1420 (which last left the town by rail in October 1971 just before the A38 was built over the track bed to then sever the rail connection) is expected to carry a fitting “Farewell to Ashburton” wreath as part of the Ashburton carnival procession which will run through the town from 6.30pm. Potentially, a bittersweet few days ahead for those who love Ashburton Station. This Friday, DNPA Members will make a decision on whether to accept the recommendations of their Planning officers regarding the Chuley Road Masterplan, despite the strong concerns raised with them. If they do, the possibility of returning a railway to Ashburton station will certainly be lost forever. Meanwhile, a former Ashburton branch locomotive is being prepared to return to the town for the first time since the line’s closure. 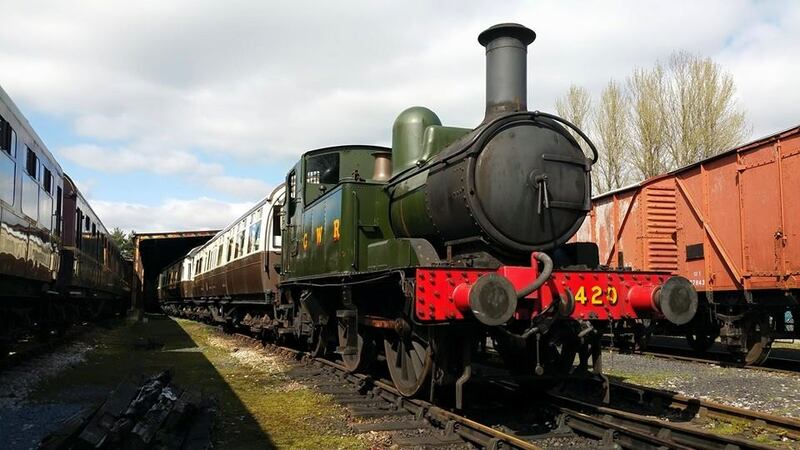 On Saturday, GWR 0-4-2T No.1420 will join the carnival procession through Ashburton on a low-loader, courtesy of the South Devon Railway, for the town’s people to enjoy. It may turn out to be the final time anyone has the opportunity to see a locomotive in Ashburton. LATEST: At the recommendation of DNP Officers, we understand that the decision on the Chuley Road Masterplan has been deferred until 3 July. It was reported at today’s meeting that the Chairman, Peter Harper, had received at least 40 pieces of correspondence regarding the issue since the publication of the final draft. Friday 5th June is when the final decision of whether to adopt the Chuley Road Masterplan goes to the members of Dartmoor National Park Authority. Please read our Statement regarding the report produced by DNPA planning department and then please send a correspondence to Mr Peter Harper (contact details below) voicing your support for a railway to return to Ashburton and any additional comments you may have. Get as many people as you can to do the same, this could be our last chance to be heard!